MCDH: Please do not think that I have forgotten how I was treated in your ER recently: I now have the name of the Dr. who was rude and intimidated his nurses into not supporting me. Dr. Ethan Ross...the same Dr. who told me he is not there to care. Local residents: Your duty as an individual is to ensure your own safety. We as a community need to come together and make sure those we pay for 'care' for us! I am so beyond hurt by this hospital and the cover ups they have involved themselves in over the years. Shame to those who do not put us first!!! My love goes to: Dr. Rochat and his staff. Just another disclaimer: I have owned this site for over 8 years and not one restaurant has paid me for advertising. The cost of the site was Macs contribution along with our reviews. My contribution, creating and maintaining it. No restaurant has anything to do with my personal feelings. Order online from 8 of restaurants who have already signed up for this great service. Tell your favorite place you want them to join the service!! Great for office lunch orders, hospice and in home health care patients. Hooked on Mendo Charter Co.
Crab season is still going!! Book your trip in advance on the Samauri for private or group outings now or for the summer. Walk to almost all of the restaurants in Fort Bragg! Cote D'ivoire - West Africa! Cuisine: Special made to order hot coffees, great fruit smoothies and an assortment of pastries. Drive thru on both sides of the A frame. Cuisine: All American breakfast, lunch, and dinner. Mexican specialties, seafood, a huge assortment of appetizers and a attached bar only open to 21 and older. Happy hour, pool tables, karaoke and more. Cuisine: Cantonese, Chinese buffet & fully made to order menu. For lunch order from the made to order menu and for dinner take advantage of the huge buffet or menu. Asian Fusion Sea Valley Cafe - NOW OPEN!!! Over the SW side of the Noyo Bridge overlooking the ocean. Cuisine: This is a quaint little family run market with homemade specialty sandwiches, salads, and specialty coffee bar. Order or purchase your meal to go or have it catered! Cuisine: Incredible breakfast made to order including one of the few places in town that offers crepes (as shown). Inside seating and free WI-FI. Great place to meet for coffee or a smoothie. First restaurant on the right hand side when heading down North Harbor Drive! Where Mayan Fusion used to be. Cuisine: handmade deli sandwiches with fresh ingredients made from scratch. Step in, mark what you want on sandwich and watch it being prepared. Very fresh & clean. Cuisine: not just sandwiches but many made to order and premade options in the deli cold case. Hot sandwiches, dogs, nacho's and more to go. Atmosphere: casual upstairs dining with a huge bar and multiple flat screen TV's. Cuisine: Italian, pasta, cocktail bar. Two sides for seating, get the one on the other side if you don't want the bar noise and in & out traffic. Atmosphere: Inside dining in two sections. Open bar to the right when you enter with dinner tables and more seating to the left with live music on some nights. Casual to elegant. 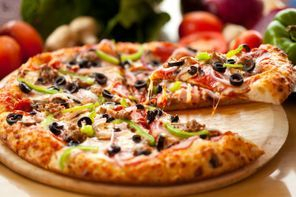 Cuisine: Italian, pizza, sandwiches, salads. Atmosphere: Perfect for a family evening out with many different options to choose from besides great pizza. Flat screen TV and a local favorite. Cuisine: Vegan, Gluten free choices for the American and Mexican options. One of the largest menus in town. You will find David's very busy but the service is very quick and the food hot and delicious. Atmosphere: Large inside dining, very family orientated with booths, tables and a coffee bar at the counter. Casual and free WIFI. Atmosphere: inside and outside deck patio seating, casual, local musicians entertain on the deck in the evening. Cuisine: Deli sandwiches, BBQ outdoor year round for hamburgers, sandwiches, plus home made soups and salads. Cuisine: American breakfast, lunch with awesome crab breakfast & sandwiches. Atmosphere: Wizard of Oz themed menu. Small and quaint with a line out the door so make sure you go early and be patient. The food comes out hot and quick and is amazing. Casual with booths and small tables for two. Atmosphere: Casual with small booths, tables and a window counter facing Main St. Cuisine: Everything made from scratch with vegan options! Ask for the peanut free entrees if you are allergic. Atmosphere: Small and quaint inside dining. Very casual but perfect for a date night or a family outing. Atmosphere: Live music in the evenings, small coffee tables for 2 or 4 with a deli case of custom pastries and cold entrees they will heat for you. Casual atmosphere and WIFI. Atmosphere: Very casual. You will find the small, 3 booth, 3 table cozy dining in the back. Fresh ingredients made to order for dining in or ToGo. Cuisine: Mexican lunch & dinner. Full bar. Atmosphere: Casual. Order ToGo ahead of time and pick it up thru the drive thru. Inside dining which is family friendly or sit on the outside patio. Coffee bar closes at 4pm - afternoon pie? Atmosphere: Casual. Sit inside at the coffee bar or at one of the open, fun, and historic scenic tables. Very family friendly. Atmosphere: Casual. Seating next to the window or if you would like a larger party they can be put together. New location!!! Bring the entire family and enjoy! Next to the Post Office...parking across the street in the Purity parking lot. Atmosphere: Casual. Small, family friendly, this is one of the local favorites. Tables and chairs with table ordering or counter ordering ToGo. Atmosphere: Casual to dressing up. Walk in to the bar which serves wine and beer. Tables and chairs in a large open space. Atmosphere: Casual with tables and two rooms for a more relaxed atmosphere. Kid friendly room. Atmosphere: Casual. Tables and chairs in a small but open dining area. Small counter for having a beer and taco for lunch is great. Atmosphere: Casual, Take out from the window on Main Street or go inside to order a coffee, cookie, or pastry. Large area for inside seating with free WIFI. Atmosphere: Take out. Head to the back of the market and order at the window what you would like. Made to order. Atmosphere: Dine in, take out, casual dining in a small cafe with tables and chairs. Nit prepares everything herself including taking your order. Atmosphere: Dine in, take out, casual and great for a date night. Cocktail bar and dining to the right, souvenir shop in the middle, and large dining area to the left. Great live music in the Sequoia Room on weekends but some shows require advance ticket purchase and sell out! Noyo Harbor...once you go thru the stop sign like your going to the harbor take the left entrance. It is on the top of the hill on the left hand side. Follow it around to the left (one way thru the parking lot) and follow it till you see the restaurant. Atmosphere: Casual but is also a great place for a elegant dinner date. After you head down the harbor and go past Silvers you will see the restaurant sign on the left hand side. Pull in and drive towards the water to the left of the tiny houses. You will see the parking in front of the restaurant. Atmosphere: Dine in, take out, casual. Large bar area and tables by the window. Booth seating. Corner of Elm and Franklin...across from the old bowling alley and between Nello's Market and Sew & Sew. Outside seating too! Atmosphere: Take out, casual. Order ahead of time for take-home pizza to make in your personal oven. I would suggest to go in and get coupons and then order...it will save you money and the time they take to prepare it is the same. A great daily lunch and lively conversation with friends (M-F 11:30am-1pm). An expanded calendar of social and educational programs especially designed by and for seniors. Field trips! Special dinners! Same owner but new great taste!! Taken by my mom on their farm in Washington state.